Club Penguin Cheats by Mimo777 Club Penguin Cheats by Mimo777: Club Penguin Halloween Igloo Decorating Contest Now Open! Club Penguin Halloween Igloo Decorating Contest Now Open! Whoa! Check it out! Club Penguin Halloween Igloo Decorating Contest has the details for the "Holiday Igloo Contest!" What an phunnie bug! Your loo has now been submitted to be judged in the Club Penguin Igloo Decorating Contest! 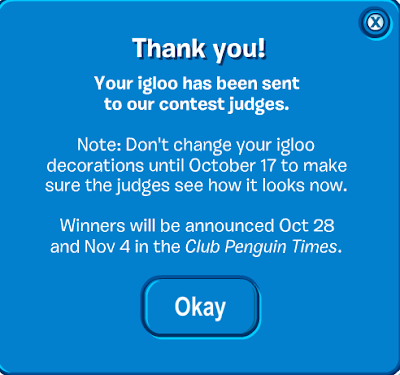 Remember not to change your igloo after you submit it to the judges. The contest will last until October 17th. Woot! Even non members can enter the contest! I can't wait to see all your awesome cool iggies! UPDATE: Due to this bug, the submit button has been removed from Club Penguin. Hopefully they will fix it soon! Have you tried "Must Pop Words?" Awesome! I'm glad there is something for non-members too! yay i just filled my house with my 3 year old stuff thats supper spooky! I can't enter the contest though. My membership expired a while ago. mimo i have just read the newspaper and if you go to the events it has anniversary party hat colors on the advertisment fo the anniversary party. This might sound silly, but, is this Holiday as in winter holidays or Halloween? Because there is a snowman when you go to submit your igloo. Last year was a pumpkin. Just wondering! Cool! Good luck in the contest! um mimo mine doesnt have the little enter the sontest icon??? CP made a glitch when they made the holiday igloo sumbit button. They took the button off so they could make the halloween button not holiday. Hope this helps! Um... doesn't it seem pointless to you that nonmembers can enter? I mean sure, it's cool, but you can't have any furniture in your iggy if you're a nonmember. Just puffles. Tell me what you think. For some glitchy reason my icon isnt on my igloo and im a member. Non members can enter too?! But they cant put anything in their igloos! Yeah, I thought that too, at first, but then I noticed that it was an old party hat. Good guess though! Wish Everyone Luck At The Halloween Contest! Sweet! I should look into my old stuff and see what I gotz in the trunk... It's probably really dusty. Oh, maybe you can get a new one for Christmas. Just a few more months. Before you know it, Christmas will be here. Actually, thats a very old party hat from the 1st Year Anniversary Party in Club Penguin. I don't think we'll find out this years until later. I'm sure after they scamper, I mean, tamper with it for a little while it will be back. Yea, I think they're fixing that now. Just can't stop those glitches from coming can they? Psst,I want to be an EPF agent.Can you send me an invite? Club Penguin removed the button from everyone so they can fix it! 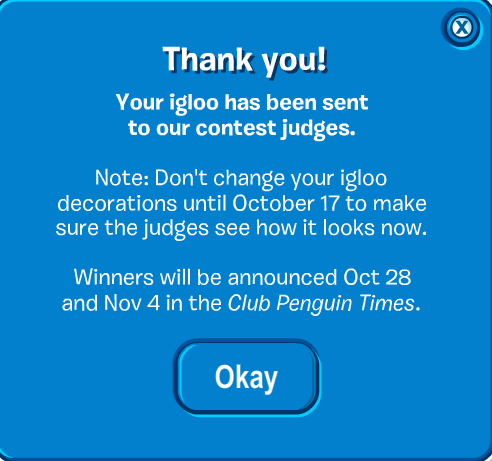 It said holiday igloo contest instead of Halloween igloo contest! Club Penguin has already sent you mail. And also you can go to the ski lodge A.K.A. Everyday Phoning Facility. Then you take the test. Dont you think they made it to obvious? For Everyday Phoning Falcility they made it obvious by putting everyday in it. Hmm... I don't see it, but maybe you're right! Good luck! I hope you have some pretty creative loo, I mean igloo, ideas! november 4 is my birthday! I dont know if this is just me but when I try to buy a new igloo it doesnt work can you check it out because I have the same igloo even though I bought a new one. Please try not to put CPG MOD if you're not modding. Thanks! It is just a glitch. Yeah! I noticed that just after I posted on another post a few posts back. Mimo calls igloos loos. It's his shortened name for em. Huh...never noticed that before! Well done discovering it! Awesome! Happy Birthday for then! You can submit your igloo again now! This isn't a glitch. What you need to do to get to your igloo you want is this. Go to your igloo, go and click edit igloo, then go into view items, then click the picture of the igloo and the igloo you want! 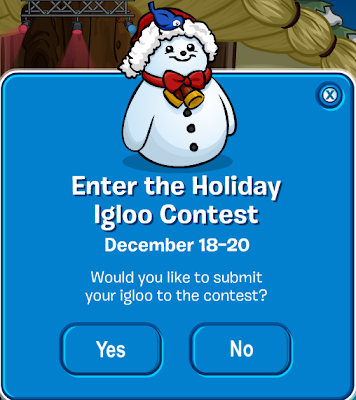 if u enter the contest when the holiday button is out, does your igloo still get entered into the halloween contest? yay i think i might have a chance of winning! Club Penguin Dark Chamber Cheats! Club Penguin Halloween Party Stamps! Club Penguin Halloween Party Cheats Here Now! Club Penguin Halloween Reviewed By You! Club Penguin Weekly Field Op Number 20 Cheats! Club Penguin Yearbook EPF Recruitment! Club Penguin Anniversary Party Still Here! Club Penguin Anniversary Party Cheats Are Here! Club Penguin Pin Cheat - BAT PIN! Club Penguin Halloween Party Start Screen! Club Penguin Partying Ninja News! Club Penguin Party Reviewed By You! Capes and Cowls is NOW OPEN in TOOTSVILLE! Club Penguin Igloo Contest Update! Club Penguin Weekly Field Op Number 19 Cheats! Club Penguin Player Card Update! Club Penguin Anniversary Party Start Screen! Club Penguin Community Blog DOWN! Club Penguin Water Card-Jitsu Proof? Club Penguin Updated Membership Page! Club Penguin Better Igloos Items! Club Penguin Halloween Igloo Reviewed By You! Club Penguin Weekly Field Op Number 18 Cheats! Club Penguin Game Day! on Mini Clip! New CPG Mods! DO OVER! Start Over! Club Penguin Mail New Halloween Postcards! New Club Penguin Room SOON? Club Penguin New Spooktacular News! Club Penguin Card Jitsu Water PROOF! Club Penguin Scary Style Reviewed By You! Club Penguin Carts & Iggies! Club Penguin Cart Surfer Update! Club Penguin Cart Surfer Stamps! Club Penguin Weekly Field Op Number 17 Cheats! Club Penguin Online Store Upgrade! Do You Miss The Club Penguin Soccer Pitch? I do! Club Penguin This and That!